It’s my ultimate comfort Sandwich Bread. Seeds, sprouted grains, a tablespoon of honey to give the crust a little extra darkness. It’s soft and crunchy and I keep making Tuna Mayonnaise Sandwiches on it. It really is a kick to make and put out something out there that is this healthy and tasty. Vegetarian (Honey), No Added Sugar, only Bee’s Honey. No Additives. High in fibre. 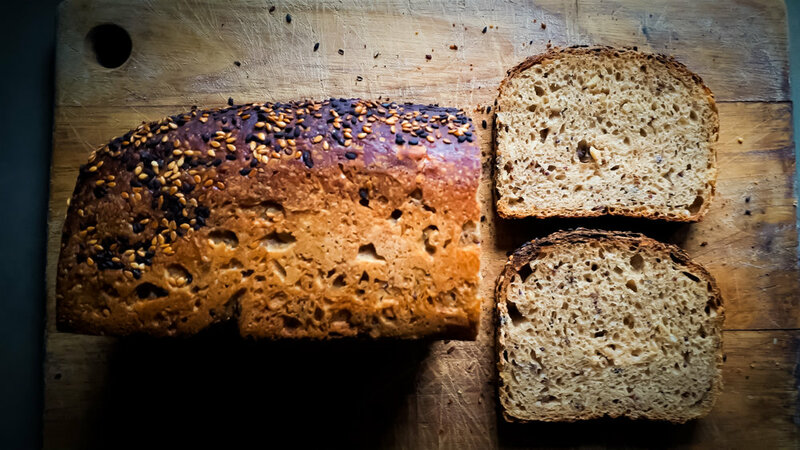 Ingredients: Wheat Flour, Water, Finger Millet, Foxtail Millet, Oats, Sprouted Wheat, Brown Rice, Sunflower Seeds, Pumpkin Seeds, Black & White Sesame Seeds, Flax Seeds, Honey, Salt and Natural Sourdough Culture. Loaf tins are sprayed with vegetable oil. 420 Calories and 9g of Fibre per Quarter Loaf. Pairs well with: Sandwiches. Hummus and peppers, tomato and mayo, grilled chicken and avocado. Just keep going. Storage: Keep in the paper bag, in a sealed box or ziplock bag for 2-3 days depending on how warm your environment is. Toast after a day gently to activate the flavour. Do not refrigerate or microwave. Slice, ziplock and freeze to store longer. Toast after defrosting. Rs. 750/- *Includes Delivery Cost within Colombo 2-7.